So in last week’s post I alluded to the fact I’d changed my diet (again! **Insert Rolly Eyes Here**). I was going to write a bit about it here but then I started rambling on and realised not everyone would care so if you do want to know a bit more about it feel free to read here. 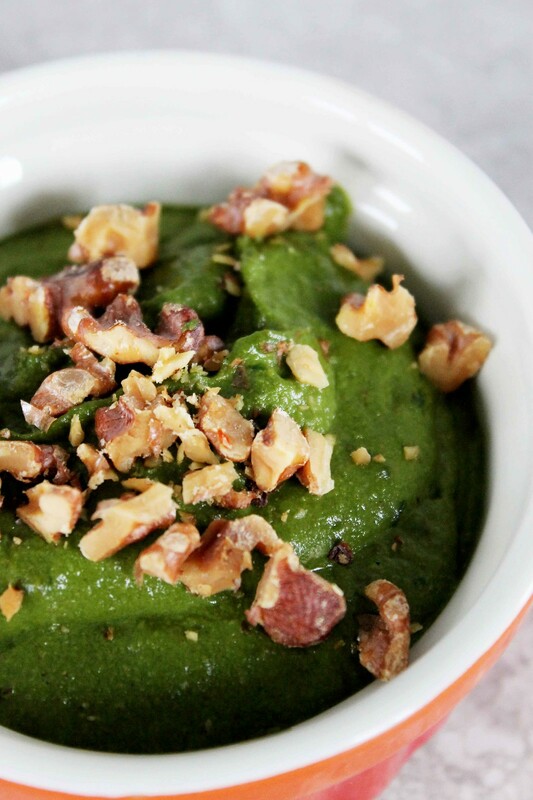 Otherwise read on for a great recipe for Roasted Walnut Spinach Pesto. 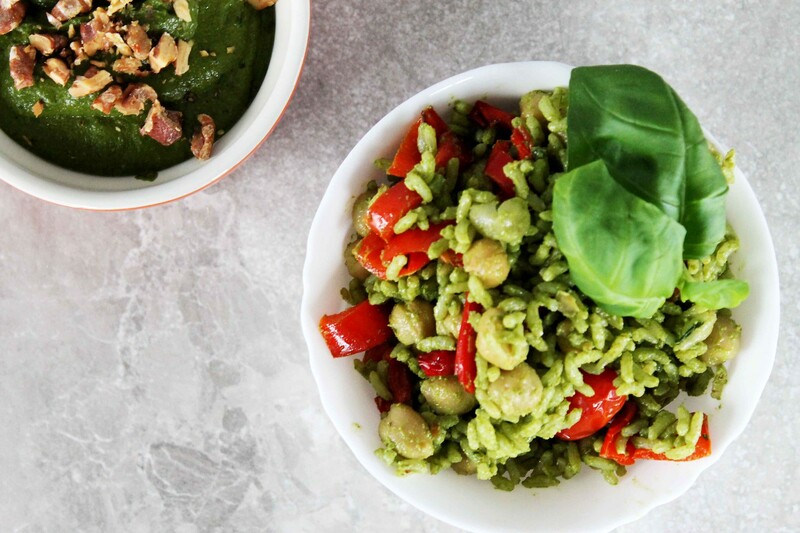 This is not your traditional pesto but can be used anywhere you’d use the regular basil/pine nut combination. I’ve made it dairy free by adding Nutritional Yeast (aka ‘Nooch’) which is a recent enough discovery of mine. Nutritional Yeast is a deactivated yeast that’s often enriched with Vitamin B12 and has a great cheesy, umami flavour. It’s a nifty little addition to your pantry, the flavour enhances almost any savoury dish. It can be replaced with the same amount of Parmesan if that’s what floats your boat! 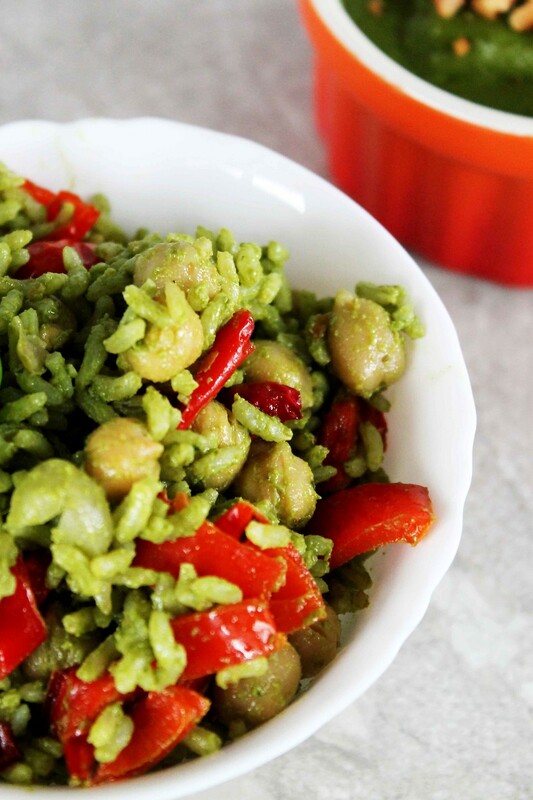 I’ve added this roasted walnut spinach pesto to some leftover brown rice here and added chickpeas, roasted red peppers and tomatoes to make great lunch or side dish. Heat your oven to 180C. Place walnuts on a baking tray and pop into the oven for about 10 minutes. Toss them about half way through to ensure they are evenly toasted. Keep a close eye on these as they can burn easily as I have found too many times! When toasted place in a food processor or high powered blender with the spinach, oil and garlic. Process until you have a creamy mixture then add the lime juice, salt, basil and nutritional yeast, pulse until combined. Store a sealed jar in the fridge, it should be good for 4-5 days. You can freeze it in ice cube trays for little individual portions that thaw in no time. This looks and sounds so yummy. I can’t wait to try it out. Adding it to my holiday recipe list right now.